Overview - In 1927, archaeologists unearthed a major historical find in Turkey. What happened next is the stuff of legend...and nightmares! In The Black Waters of Echo's Pond, nine friends take a holiday at a Victorian home on a private island off the coast of Maine. There, they uncover a game first discovered as part of an archaeological expedition from over 80 years ago that resulted in a series of mysterious – and grisly – deaths. What they don't realize is that when played, the ancient artifact brings out the worst in each of them. Jealousy, greed, hatred, lust, all of the things they keep buried deep inside themselves rise to the surface and come to a boil. A warning to all those who start the game: it just might finish you. What happens when you take the premise of 'Jumanji' but get rid of all those monkeys and that scraggily bearded Robin Williams and instead add lots of blood, guts, an annoying group of clichéd characters, and a goat demon? Well, uh, apparently 'The Black Waters of Echo's Pond' happens. Though, I kind of wish that it didn't. A low budget, pedestrian, horribly acted, generically directed, dully written, and rather ugly attempt at slasher horror, the movie is about as fun to sit through as… well, as watching a bunch of clichéd characters playing a terrible board game. A group of friends head off to a secluded island together for a vacation. After rummaging through the house they're staying in, they come upon an ancient demonic board game, and like any good, intrepid group of characters in a horror film that are clearly keen on getting themselves killed, they decide to play. As they are forced to confront their darkest desires, regrets, and sins, an evil presence slowly begins to influence their actions. Now seemingly possessed, the friends eventually turn on each other, and they're all after blood. Low budget slasher flicks aren't exactly known for their high quality acting, but the awkward, stilted performances here are really in a class all their own. A remedial class full of students held back several times. Sure, some of the more experienced members of the ensemble like James Duval, Robert Patrick, and scream queen Danielle Harris are decent enough, but the majority of the group is kind of painful to watch. Of course, the clumsy, awful dialogue they're forced to spit out doesn't help matters much either. Nothing more than thin and very irritating stereotypes, none of the ensemble is the least bit likeable, and while their numerous vices become essential to the plot, making them all so unpleasant leaves little for the audience to invest in. One by one the characters take turns playing the demonic board game they find, and one by one they are forced to answer oddly worded, slightly cryptic questions about their personal lives that seem specifically designed to stir up trouble (I guess demons really like icebreakers too). Initially all this really leads to is a droll series of clunky scenes where the group yells at each other for all the horrible things they've done, and these sequences play out like a really bad afterschool special with agonizingly forced (and bloodless) histrionics. As one might expect, there are a few supernatural twists to the proceedings as well, however, resulting in dangerous visions, murderous possessions and, for some reason, a goat monster. I'm not really sure what the purpose of said goat monster really is, but I think he's supposed to represent Pan from Greek mythology. Either way, all he really does is sneak around in the background and creepily touch people. In fact, other than being a walking sexual harassment lawsuit waiting to happen, he doesn't seem to ever pose much of an actual threat. Instead, it's the group itself that ends up attacking each other -- that is, with the help of some demonically possessed shadowy eyes (you know, to let the audience know they're evil). And it's at this point where the filmmakers make up for the movie's initially gore-free drama by offering a bloodbath of disgusting kills and torture scenes. The makeup and effects throughout these gruesome scenarios are decent, but all the violence and mutilation lacks any shred of actual tension or fear. Rather than providing scares, the mean-spirited carnage is just gross and kind of boring. Even with its half-hearted attempt at a "twist" ending, 'The Black Waters of Echo's Pond' is a totally forgettable and nearly incompetent attempt at horror filmmaking. There's a fair amount of blood and guts, but there are no real scares, resulting in a flick that comes across as cheap, ugly, and dumb. The evil board game premise has some potential, but the writers' take on the idea lacks any real imagination. If you're in the mood for good contemporary horror this Halloween, you're much better off checking out titles like 'The Conjuring,' 'American Horror Story: Asylum,' 'Mama,' and 'Evil Dead.' And if you're in the mood for a good flick about a supernatural board game, 'Jumanji' basically remains your only choice. Believe me, even poorly rendered CG monkeys are better than a useless goat demon. 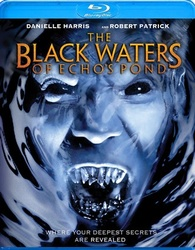 Starz/Anchor Bay brings 'The Black Waters of Echo's Pond' to Blu-ray on BD-25 disc. After some logos and warnings, the disc transitions to a standard menu. The release is region A coded. The movie is provided with a 1080p/AVC MPEG-4 transfer in the 1.78:1 aspect ratio. The film's low budget is apparent, but the picture carries a solid sense of detail and isn't riddled with any egregious technical issues. The source is mostly clean and artifact free, but there is some minor noise in dark scenes and some marginal false contouring visible in certain shots of the sky. Clarity is good throughout, revealing relatively sharp detail. With that said, the film's style is inconsistent and uneven from shot to shot, making the image look pretty amateur in several scenes. Likewise, the picture lacks dimension and frequently carries a blown out, overexposed look in daytime scenes. Saturation is decent, and gruesome red blood, a few moody lighting choices, and shimmering waters offer some marginal pop. Black levels are steady and offer good shadow delineation. 'The Black Waters of Echo's Pond' looks just fine on Blu-ray. Detail is mostly sharp, and while the film's cheap style is inconsistent, the transfer is solid. The film is presented with an English Dolby TrueHD 5.1 track and optional English SDH and Spanish subtitles. It pales in comparison to truly great horror soundtracks, but the mix offers an appropriately creepy and occasionally aggressive soundstage. Dialogue is clear and full-bodied throughout, but as one might expect, there's a fair amount of spooky, overwhelming music cues that can overpower speech. With that said, these instances all carry good range and separation. The soundstage has a decent sense of space and some requisite ambient effects like crickets and crackling fire add welcome but not particularly involving atmosphere. Other effects like gunshots and chainsaws (yes, this is that kind of horror movie) offer some solid low frequency kick and rumble as well. This is a pretty standard low budget horror movie track, and while the mix doesn't really standout, it bolsters the film's attempts at scares well enough. Alternate Openning (HD, 3 min) - Presented in 1080i with Dolby Digital 2.0 audio, this is an alternate, slightly gorier and equally stupid and unnecessary flashback opening sequence. 'The Black Waters of Echo's Pond' is an ugly and boring attempt at slasher horror filmmaking. The demonic board game premise has some potential and there is a lot of gross-out violence for gore-junkies, but the acting is clumsy, the drama is forced, the direction is exceedingly amateur, and there are no real scares. Though they clearly reveal the movie's low budget, the video and audio presentations are decent. Sadly, the only included supplement is a useless alternate opening. This is a terrible slasher flick and a mediocre disc. One to avoid.